Sore, bleeding gums indicate the beginning of periodontal disease. If left untreated, discomfort, bad breath, and eventual tooth loss will result. 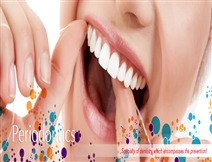 At Lumident, we think that periodontal health should be achieved in the least invasive and most cost-effective manner. This is often accomplished through non-surgical periodontal treatment, including scaling and root planning (a careful cleaning of the root surfaces to remove plaque and tartar from deep periodontal pockets and to smooth the tooth root to remove bacterial toxins). However, non-surgical therapy has its limitations. Surgery may be indicated to restore periodontal anatomy damaged by periodontal diseases and to facilitate oral hygiene practices, specifically when the tissue around your teeth is unhealthy and cannot be repaired with non-surgical treatment.